Everyone seems to think that when it comes to pillows, the thicker and fluffier they are, the better, right? When you go to a hotel, very often one of the things you end up falling in love with is the thick pillows. More than once, I must confess, I have wondered where hotels get their awesomely fluffy pillows. But hold on for just one minute. It has come to my attention that when it comes to pillows, bigger does not always mean better and that there are times when thin pillows are actually better for people. This seems to defy conventional wisdom. After all, why would anyone choose to have a thin pillow when they can have a great, big, fluffy one? Now, as I have said over and over again, there is no best pillow for everyone. Pillow preferences are highly personal and subjective. Whatever suits you best is what gives you a good night’s sleep and helps you wake up rested and refreshed in the morning, ready for another day of work or school. And yet, experts believe that in certain cases thin or slim (or even ultra-slim!) pillows are better than thick ones. There are times when a thin pillow is more advisable to be used than a thick one. Read on and I’ll tell you all about it. What is a thin pillow? While there are no strict guidelines on what makes a thin pillow, most industry experts agree that it is the loft of the pillow that determines whether it is a thin or thick pillow. 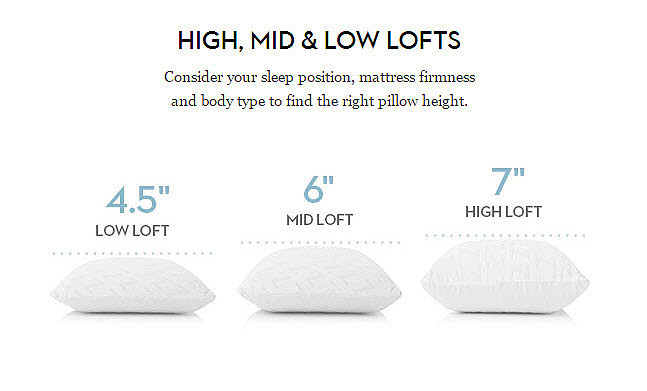 Pillow loft simply refers to the height or thickness of a pillow. Low pillow loft refers to pillows that are less than 3 inches (7.62 cm) high. Medium pillow loft refers to pillows that are 3 to 5 inches (7.62 cm to 12.7 cm) high. High pillow loft refers to pillows that are more than 6 inches (15.24 cm) high. Thin pillows have a low pillow loft, measuring around 3 inches in height, and varying in material, covers, special features, etc. Now, there are also ultra-thin pillows that are even less than 3 inches high, ranging anywhere from 1.8 to 2.5 inches in height. How do I know if I need a thin pillow? One way to determine whether a person needs a thin pillow can simply be a matter of size. The website sleeplikethedead.com discusses all sorts of things that make for a good sleep. It was created in 2008 by a man named Nick Robinson, who is unashamed to be passionate about sleep. Mr. Robinson suffered from terrible insomnia for many years, and his life was miserable. He was able to recover from insomnia, and in addition to this, started the pursuit of the best sleeping conditions possible by reviewing materials that affect sleep such as beddings, mattresses, pillows, white noise machines, and the like. In helping himself get better sleep, Nick Robinson wanted to help other people get good sleep too. On one of the pages on his site, he provides a pillow loft calculator for everyone, based on your preferred sleeping position (back, side or front) as well as your size, weight, head and shoulder size, and how firm your mattress is. This guy’s got this thing down to a science. And it makes perfect sense, because if you think about it, how can a large person be comfortable with a thin pillow, and how can a small person sleep well with a very big one? The website explains why the different factors come into play when it comes to pillow loft. Side sleepers generally need pillows with a medium to high loft, because of the space between the shoulder and the side of the head that the pillow needs to fill. Back sleepers generally need a medium loft pillow, since a high pillow could cause some amount of neck strain. Front or stomach sleepers need the lowest loft of all, and it is not uncommon for some to not use pillows at all. The size of the head – the bigger your head is, the more likely you are to need a pillow with a higher loft size to support it. The size of the body – if you are a big person, you actually sleep closer to the mattress of your bed than a slimmer person does. In such a case, you may need a pillow with a lower loft, as you are already quite close to the mattress. The width of your shoulders – if your shoulders are quite broad, you may actually need a loftier pillow because your head will be far from the mattress. The narrower your shoulders, the closer you are to the mattress, and so you won’t need a very lofty pillow. The firmness of your mattress – If you prefer a very soft mattress, you generally need a thinner pillow. The firmer your mattress is, the more loft you need in a pillow. And finally, where you place your head on the pillow — some people sleep with their head fully cradled onto a pillow, and some place their heads only at the edge of a pillow. If you are in the former category, meaning you sleep with your whole head on the pillow, you’ll generally need a less lofty, or even a thin pillow. If you sleep at the edge of the pillow, you’ll need a higher pillow. Who really needs a thin pillow? The biggest goal of any pillow is to ensure spinal alignment and adequate support for your head. As we know well by now, this is the only way that you will wake up pain-free in your neck, shoulders and upper back. So in theory, anyone can use a thin pillow, as long as it gives them enough rest. And in reality, thin pillows work best for back sleepers, stomach sleepers, people of small or petite stature, and children. If I have neck pain, should I try switching to a thin pillow? The answer to this is yes. The neck pain you suffer could be due to a misaligned spine as you sleep, because of a pillow that is too high. You may want to try out a thin pillow and see how it works for you. Pro tip: why not get a pillow with a 30-day warranty, so that you can return it if it does not work for you? My young child has never used a pillow. Should I use a thin pillow first to make the transition easier? This is actually a good idea. Children who have never used a pillow may find a high or even medium loft pillow to be uncomfortable and may have a hard time sleeping while trying to adjust to a normal pillow. Having them sleep on a thin pillow can definitely make the adjustment easier. Besides, most children sleep on their backs and stomachs anyway, so having a thin pillow is a good choice. I’m pregnant. How can a thin pillow benefit me? As all mothers know, a comfortable sleeping position is a big challenge the further along your pregnancy you get. You can use a thin pillow as a support for your stomach by sleeping with it on your side. I’m a side sleeper, should I switch to a thin pillow? In general, this is not the best idea. You need good support for your head and shoulders, and a higher loft would be ideal for this. However, if you do want to try out a thin pillow, go for the thicker ones among them, not choosing the ones that are under 3 inches in height. Aside from loft or height, what else should I consider when choosing a thin pillow? As always, when choosing a pillow, the material or stuffing used to fill the pillow is an important consideration. If you get easily warm when you sleep, you may prefer down, buckwheat or other natural materials for your pillow, since they are more breathable than synthetic materials such as memory foam or other latex types of stuffing. When the manufacturer labeled this pillow as “ultra slim,” they weren’t kidding. Coming in at only 2.5 inches (6.35 cm) thick, this pillow is very versatile. It’s flat on one side to keep it from moving around in your bed since thin pillows tend to be lighter. This one is only 1.8 lbs, which means it weighs less than a kilo. The other side is rounded, like any normal pillow, on the other. It was created specifically for back and stomach sleepers and is filled with memory foam that is hypoallergenic and resistant to bed bugs, as well as anti-bacterial and anti-microbial. This pillow also comes in an extra-firm version for $35.95. Now, I don’t know why the extra firm one is actually less expensive than the regular model, it just is. It’s also 2.5 inches (6.35 cm) thick, and like the Elite pillow above has a flat surface and a rounded one. Unlike the Elite pillow, this is a cooling thin pillow, since it uses gel-infused memory foam, and is ventilated for good air flow throughout the pillow. It’s also hypoallergenic and has a bamboo-derived washable cover, which is said to be ultra soft. And it is also quite flexible and can work as a lower back support cushion, or can be placed between the knees, as well as being a regular bed pillow for sleeping. And, unlike the Elite pillow as well, this thin pillow packs some considerable heft at 3.55 lbs (1.6 kg.) 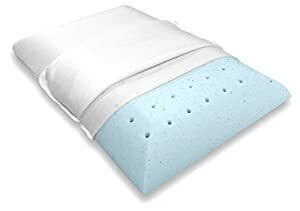 A lot of people like this pillow very much indeed, some mentioning that it’s a great pillow for stomach sleepers and that their neck pain disappeared after they used it. And the cooling function of the pillow was a definite plus. TruContour advertises this pillow as perfect for stomach and back sleepers since it’s only 3 inches (7.62 cm) thick. 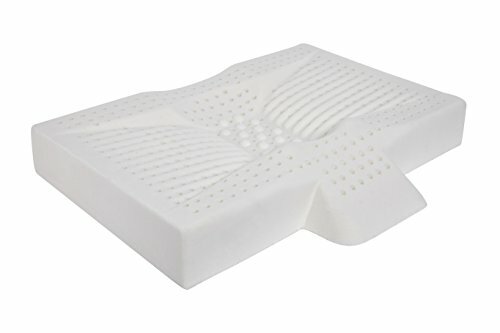 This thin pillow is available both in the firm and soft models, depending on your preference, and both types are made of medical-grade memory foam gel. It comes with a very soft, double-knit cover in organic cotton, which is said to make the pillow more breathable. Like other pillows, it is also dust-mite resistant and hypoallergenic, and its cover is completely machine washable. TruContour stands by this pillow so much that if any damage should happen to it within one year of purchase, they will replace it free of charge. And, if you are unsatisfied within a month of buying it, they will give you back your money in full. This thin pillow seems to work well for people with back and neck pain issues, and who have swapped out their regular pillow for a thin one. 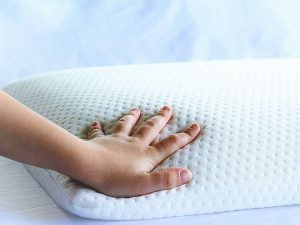 For a memory foam pillow, there have been no complaints of strong “off-gassing” smells, however, a few people who have used this pillow say that even the soft version is still a little too firm. It certainly is quite a bit heavier than the other pillows, coming in at over 4 pounds, which is almost 2 kilos. This thin pillow was specially designed for people with pain issues not only in their necks and shoulders but also for those who suffer from TMJ (Temporomandibular Disorders) which can be extremely painful in the jaw area. Indeed, this seems to be a wonder pillow of sorts, as it claims to combat wrinkles, acne, and aging, reduce snoring, and aid with facial surgery recovery. Sounds impressive, right? This thin pillow is made of 100 percent natural latex. It has a hollow “nest” in the middle of the pillow for cradling your head. This is the thinnest area of the pillow, at only one inch (2.54 cm) thick. It fights wrinkles, acne, and aging by keeping your face off the pillow, and so serums and moisturizers on your face do not rub off. The “nest” also keeps your head and neck in perfect alignment, thus eliminating pain. It is designed to help reduce snoring by keeping your mouth and nose unobstructed. And, buyers unsatisfied with the pillow get a full refund within 30 days of purchase. It has a little bit of a higher loft at 3.5 inches (8.89 cm), but is not as heavy as the other pillows, since it’s only 2.8 lbs, which is less than a kilo. Its cover is fully machine washable, too, though some users choose to put a pillowcase on top of the cover. Users report great satisfaction with the pillow, especially those who suffer from TMJ and neck and back pain. 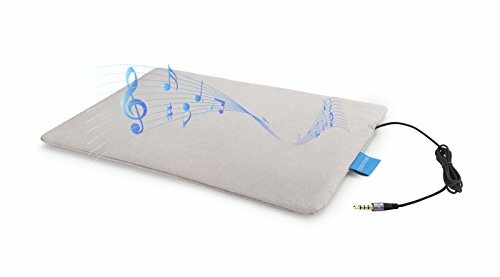 This medical thin pillow seems to be well worth the price. The Pancake Pillow is exactly what it sounds like—a fully adjustable stack of six thin layers so that you can choose the perfect fit for you. This way, it works for back sleepers, side sleepers, and stomach sleepers. It’s filled with down-alternative microfiber fill that is also hypoallergenic, and its pillowcase is 100 percent cotton with a 300 thread count, and the zipper runs through three sides for convenience. Sounds impressive, right? The Pancake Pillow is manufactured by Gravity Sleep. You can also buy extra pillowcases, and if you like sleeping on thin pillows, you can sleep on two of the layers, which means you could actually make three pillows from one order! 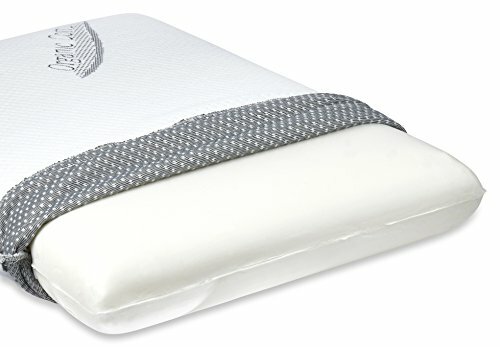 This pillow is completely machine washable on the gentle cycle and can be returned if you’re unhappy with it since Gravity Sleep guarantees satisfaction. As the name suggests, this super slim pillow mat has several extra functions that normal pillows don’t have. First of all, it has speakers that you can listen to music or podcasts to when you connect your phone or media player to it, and the beauty of it is that it’s only the person lying on the pillow who can hear the sounds, even the person sleeping beside you won’t hear what you hear. So, this is great for couples, right? If you like to sleep with music on, and your partner doesn’t, no sweat. And the partner who likes music doesn’t have to wear earbuds or headphones every night. On the downside, the player inside the pillow does not have any volume control, so you pretty much get the volume that the player sets, and won’t be able to adjust it. 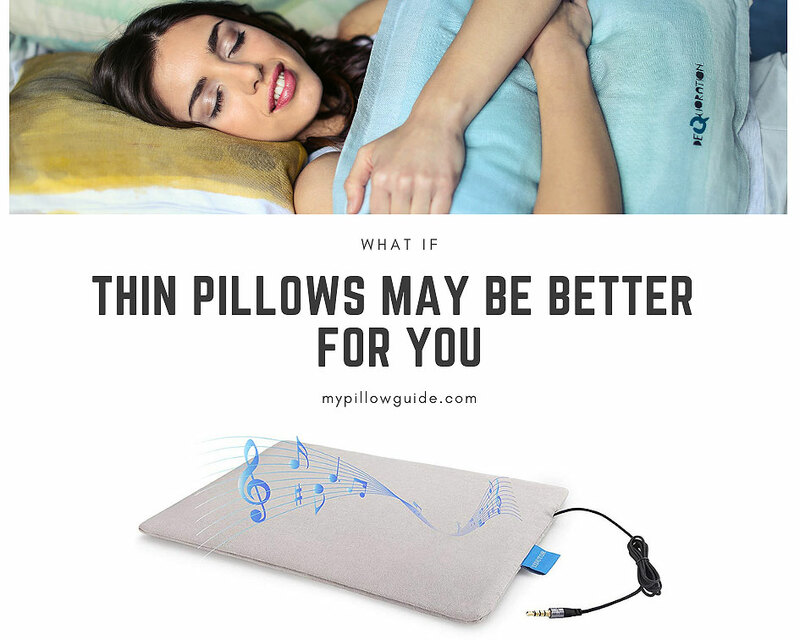 What’s also cool about this thin pillow is that it includes a sleep tracker whose data is transmitted to your cell phone, so you can keep track of how well or how poorly you sleep every night. It also comes with an “intelligent alarm clock” to wake you up at your lightest moment of sleep. Would you give a thin pillow a try? Honestly, I am very happy with my medium loft pillows, especially since I read, and sometimes even work on my laptop in bed. But, having said that, it’s so good to know that thin pillows are readily and widely available, and I will keep them in mind for future pregnancy, children and health issues. 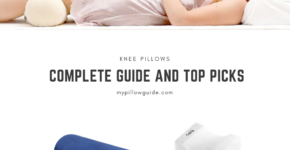 If you’ve suffered from neck pain, and want to try out some regular loft pillows, check out this article I wrote, where I list the best pillows for neck pain available. I hope my suggestions help you find what you’re looking for. Would you like to try a thin pillow for yourself? Or do you have one and it works well for you? Let me know in the comments, I always love to hear “pillow talk” (pun intended!) from everyone. Hi, thank you so very much for this great information. I am a chronic “snoring machine”. I showed my wife the information on the Lumalife Lux, she immediately hit Control “D” and saved this page. I think I know what I am getting for my birthday. I appreciate the information, and my wife, well, is elated. I am really glad I came across your article before I bought a new pillow. Now I know that as a back sleeper, I need a thin pillow and should not buy a high pillow. Whats your take on water pillows? Someone recommended it to me recently, but I am just not convinced. So there’s a collection of pillows in our bedroom closet on the floor… pillows that are just not thin enough, not firm enough, not “just right” for my husband. I tease him that he likes to sleep with his head on a rock. In all honesty he’s bought probably over 15 pillows in the 6 years we’ve been married, hoping to replace his “tried and true” that he has been using for who-knows-how-long. We’ve tried setting heavy books on top of “almost firm enough/thin enough” ones, tried all sorts of things, but it’s never just right. (He’s a super easy person to please, so this is a big deal for us LOL). I’m going to show him the TruContour one – I love how many of the reviews say it’s almost “too firm”… that sounds just about right for him! We’ve never bought a pillow online, but this may be a first. Thanks for the suggestion! Hello, I have never taken into consideration those needs when choosing a pillow but what I know I like using nice pillows and soft but firm pillows. Some many problems arises when using bad pillows include necks, back aches and so much more. Thanks alot for the valuable information I will gladly share it. Thank you for explaining the difference in the types of pillows. I was always under the impression that a thin firmer pillow was good to help keep my head, neck and spine in alignment. Not sure if that’s true since I keep turning at night. The first thing I noticed is how clean the site looks. Not a lot of clutter, which is good. I also like the list of pillow types and descriptions. Here I would suggest having your links to amazon open in a new tab. The longer the reader stays on your site, the better. If they click on a pillow after only a few seconds, google may think the reader found nothing of interest and it may hurt your ranking. Same with the links to “sleep like the dead”. Your comment with your sleep calculator results shows your personal interest in the topic. You are providing your readers with good information. I like your about (me) section, why hide it at the bottom of the contact page? People like to see who they are dealing with. To me it shows that I am dealing with a real person and not some large company that really doesn’t care about anything but my money. A thin pillow seems like a good idea for me since I tend to sleep on my stomach. Thicker pillows seem to give me a neck ache or headache. I use a thin pillow currently but it seems to be too firm. 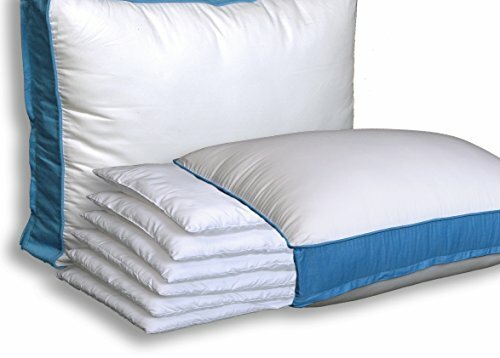 Is there a pillow that is thin but maintains softness over time instead of becoming more firm and compact? Have you tried memory foam pillows? Wow this is a great article! You specifically speak of people who may need a thin pillow and why. At the same time going over what works best for who. Taking into account a persons, weight, height, etc. You also go over which position a person sleeps in most. Love the detail you put into this, because it is very true each person is different. Each person needs the pillow that works best for them. There are very few things in life as serious as the choice of pillow. I would go as far as saying that the world would be less grumpy and punchy if everybody slept on a suitable pillow. It took me decades to figure out that I need a medium hight but firm and, slightly shaped pillow. If I have space in the suitcase, I will take it on travels. Hotels tend to provide just one, far too soft pillow and this will result in a stiff neck and grumpy mood in the morning. Buying a pillow is like buying clothes. You would never get a shirt or dress that is not your size or style (if you have one). Same applies to pillows. Excellent article everybody should read and act upon. Hi, this is very interesting. I tend to start the night on my side then end up on my front. When on my front I push the pillow away completely. The amounts of specialized pillows available is new to me. The Face surgery pillow which seems to be the same as, or resembles the LumaLife. I like to rest with my face toward the ceiling. It looks like that pillow would encourage that sleeping position throughout my rest. My pillows are memory foams and the other regular ones with bits of synthetic filling. Of the two I prefer the memory foam. It looks like the Pancake Pillow would work well at the end of a sofa where I lay back when reading. I’m glad to have stumbled across this site. Copyright © 2019 · mypillowguide.com All rights reserved.